Quit using filters on your iPhone 7 to fake unique effects and enhance your mobile camera with Lensbaby Deluxe Creative Mobile Lens Kit instead. This bundle of mobile camera lens accessories will inspire you to push your photography creativity with your iPhone 7's iSight camera. The included LM-10 Small Sweet Spot lens adds a dreamy blur around a small spot of focus for a dramatic effect. Alternatively, the LM-20 Large Sweet Spot lens is your go to mobile lens adapter when you want to catch a larger spot of focus with the intentional smooth blur all around it. Finally, the kit's LM-30 Refracted lens lets you achieve the ultimate mobile photo effect by producing a circular image and then enveloping it in breathtaking reflections. 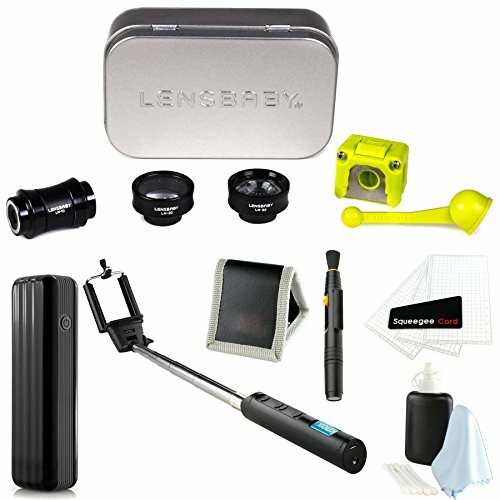 All you need to produce professional looking artistic special effects with your phone's camera is the Lensbaby Deluxe Creative Mobile Lens Kit. Download and install the free Lensbaby Mobile App to open up a world of creative possibilities with your iPhone 7's camera. This dedicated app complements the Lensbaby Deluxe Creative Mobile Lens Kit so you can get the most out of your shooting experience, This dedicated app lets you do cool things with your mobile camera lens like move the spot of focus around the frame, lock white balance and exposure, and seamlessly toggle between video.